This peak is most easily climbed from Gjendebu. Follow the first part of the trail from Gjendebu that runs through Svartdalen to Torfinnsbu. As you approach 1400 meter, the uphill becomes more gentle. Look for a trail that forks right, it is marked with cairns, but is smaller than the main trail you have been on. 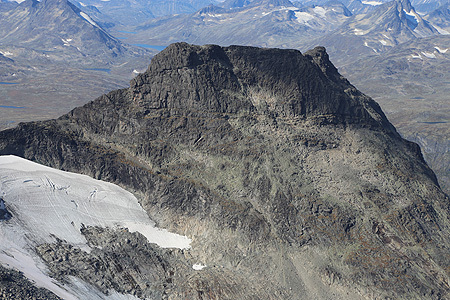 Follow this trail (marked with cairns all the way) to the summit of Nordre Svartdalspiggen. From here, continue on the connecting ridge to Store Svartdalspiggen. There may be some easy (YDS) class 3 scrambling along the way. I climbed this peak on my way from Bygdin to Gjende. It was the last peak on a fine ridge traverse starting with Mesmogtinden and Langedalstinden. More info under Mesmogtinden.